Karen Renee Vaverka, 62, of Olathe, passed away at home on November 15, 2016. She was born on August 18, 1954 to Kenneth Kee and Naomi Ruth (Jantz) Pollard at Hydro, OK.
Karen married Dennis William Vaverka on July 5, 1974, in Burlington, KS. They made their home in Olathe, KS, where they resided 42 years. Karen was a devout Christian, with love and service to God and people as the focus of her life. 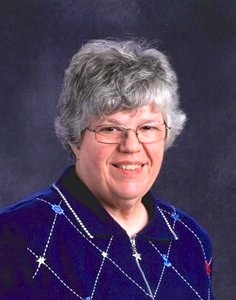 She was a member of College Church of the Nazarene, Olathe, KS, where she worked with children and senior adults. Her strong love for music led to her involvement in the sanctuary choir and the bell choir. As a certified sign language interpreter, she signed for church services for many years, as well as for local events and international church conventions. Wherever she was, Karen was always doing something productive such as reading or working on a project of some kind, keeping her mind and hands busy. She was talented in sewing and various types of needlework and particularly loved to crochet, continually making afghans, baby blankets, shawls for people facing surgery, and originally designed items. Every year, she crocheted snowflake ornaments to send with Christmas cards. She was an experienced photographer and could usually be seen behind a camera rather than in the picture. She documented family and church events as well as activities where she taught through photos and videos. She enjoyed computers, continually learning the newest technology available, and she willingly shared her knowledge with anyone who needed assistance. Karen loved to learn, earning the honor of Salutatorian of her high school senior class. She was an avid reader and enjoyed crossword puzzles. She earned a Bachelors degree in Education from MidAmerica Nazarene University, Olathe, KS, a Masters degree in Computer Technology from Leslie College of Boston, MA and a Masters degree in Library Science from Pittsburg State University, Pittsburg, KS. Karen worked as a switchboard operator at Olathe Medical Center for several years and at Guaranteed Foods in Kansas City as an Executive Administrator for 17 years before finishing college with a teaching degree. Karen was preceded in death by her parents. She is survived by her loving husband, Dennis; her sisters, Ruth (David) Nantze, Janice Brown, Becky (David) Fowler, and Soni (Tino) Valesquez; 9 nieces and nephews and their families; and countless friends and students whom she influenced throughout her lifetime. Karen’s legacy will live on. In recognition and in honor of Karen’s love of books, donations of paperback books will be collected at the visitation and funeral service, and given to the Johnson County Sheriffs Office for use in the local detention centers.